With discounts between 10% and 50% dependent on Grading, our Luxury Outlet mattresses also come with our Love It or Return It guarantee. 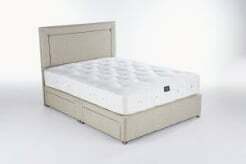 Our Divan Luxury Bases are hand made here in the Uk. They can be made to provide Four Quarter, North to South or East to West access to fit your requirements. Fill in your details below and we'll contact you when the product you're looking for is back in stock.